Many photographers now specialise in newborn photography and a newborn session is on many new parents to-do lists. However, within the past couple of years “milestone sessions” have also become increasingly popular. Not only are these a lovely addition to offer the new parents but also a great ways of tying clients in to future sessions. 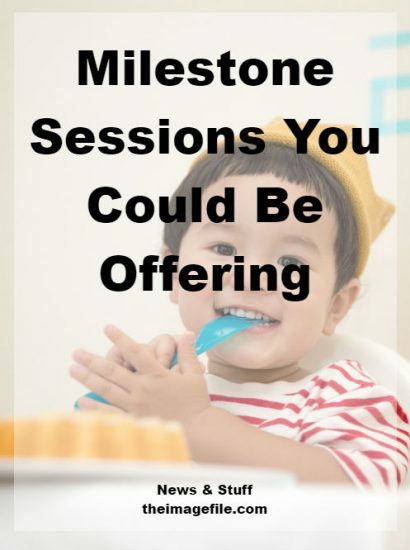 Here are a few ideas of milestone sessions you could be offering clients. Note: Remember that a baby’s development can vary massively, so you as the photographer will have to be ready to change your schedule to fit the baby in. Also be aware that this can be a very sensitive area for new parents so be appreciative of their baby’s developments. For many babies, three months old is the time when smiles first appear. This is a real defining moment for many new parents and a memory they will never forget. Offering a three month sessions is a lovely, sentimental way of capturing those first few grins. Another thing to consider is offering these milestone sessions as a mini session, where instead of perhaps an hour or two hour session you focus on the baby’s new development for 30-45 minutes. Rolling and getting on the move tends to be on a baby’s agenda at about six months old. Why not offer to capture those first tumbles and turns for new parents with a six month mini session? Babies start to sit up on their own from about 9 months old. This is a huge moment for parents because it’s the first time their baby starts to become a little independent. A nine month mini session is the perfect way to capture their gorgeous baby going solo for the first time. A Cake Smash session has grown in popularity during recent years and is a lovely, fun momento of a child’s first birthday. Many newborn photographers now include this session in their repertoire but if you don’t yet offer this milestone, it’s a really great one to include. A baby’s first Christmas is a very special time and a wonderful period for new parents. Why not offer a Christmas themed shoot which can then be used for Christmas cards, thank you notes and gifts for grandparents? All of these sessions are great milestones that you could be offering individually, however a lot of newborn photographers also offer a “your baby’s first year” package that includes all the mentioned sessions as well as a newborn shoot which ties parents in for longer. What other baby milestone sessions could a newborn photographer be offering?